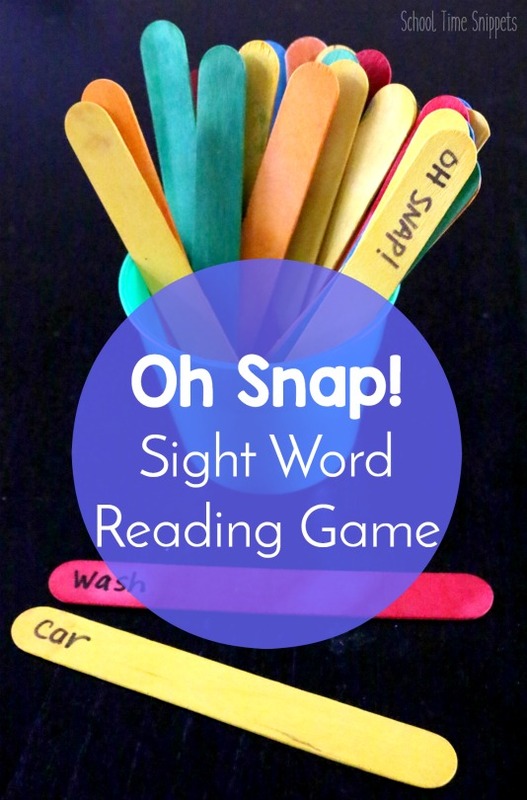 Push the flashcards aside and play our favorite high frequency word game: OH SNAP!! This super fun sight word game is a great way to improve reading skills and build reading fluency. Oh Snap! can be tailored to your child's reading ability & is perfect for Kindergarten, 1st Grade, and/or 2nd Grade. Teaching your little one to read is bittersweet. Your child is learning a new and very important skill!! Yay! Or is that just me?!! Is that a little too honest?! Having taught big brother and now working on reading with my 5 and 7 year old, sometimes it is finding the balance between teaching new sounds and word combinations while being cautious to not overwhelm your new little reader. It's working on words he/she may already know through repetition, so your little one will soon be able to "sight read," while slowly introducing new sounds to make new words. And that's one of the reasons I love homeschooling... being able to go at the pace of my child. Sometimes that pace is one new sound every couple of days, other times it is three sounds in one day! A good way to build reading success is to introduce sight words. Sight words are typically words that are taught through memorization. They are the most common words found in books; words such as: the, and, first, to, then, was, etc. etc! There are some differing opinions on whether or not to teach sight words. I think teaching both sight words and phonics have value. Now, using Logic of English curriculum has put a different spin on the term "sight word" as some may know it. Through Logic of English, I have learned that instead of simply having the child memorize the word, many "sight words" can be taught through phonics and/or knowing spelling rules first. I think learning to read and spell by understanding phonics rules will help my beginning reader improve her reading skills. Now once she understands those rules, ironically, those words do become "sight words" as she no longer will have to sound them out, but will intuitively know them! So How Do You Improve Reading Skills So That You No Longer Sound Every Sound Out? Give your beginning readers plenty of practice to work on improving their reading fluency by playing games! To keep learning how to read "light" and playful in the midst of constantly adding words my child can read and working on repetition so she knows them by sight, we set up this fun high frequency word game to improve her reading skills. We have been playing this game to work on sight word fluency the past few days, and my daughter LOVES it!! It's a super fun way to improve reading skills. It can be adapted to any word list, so it's great for Kindergarten, 1st Grade or 2nd Grade! I don't remember where I came across the "Oh Snap!" popsicle stick games or what the theme was, but I did take the idea and create an Oh Snap! USA State Study Game for Big Brother not too long ago. He thrives on games and it was a fun way to work on memorizing the location of the 50 states in a fast paced game setting. To work on reading skills, I took the basic idea of that popsicle stick game and used it to focus on high frequency words. Go stock up on popsicle sticks!! Improve Reading Skills by Playing Oh Snap! On a set of popsicle sticks, write a word on the bottom of each stick. Choose words that may be on your child's reading list, high-frequency words your child comes across in books, simple CVC words, etc! On at least two sticks, write the words "OH Snap!". Note to self, you do not want to pick one of these popsicle sticks!! 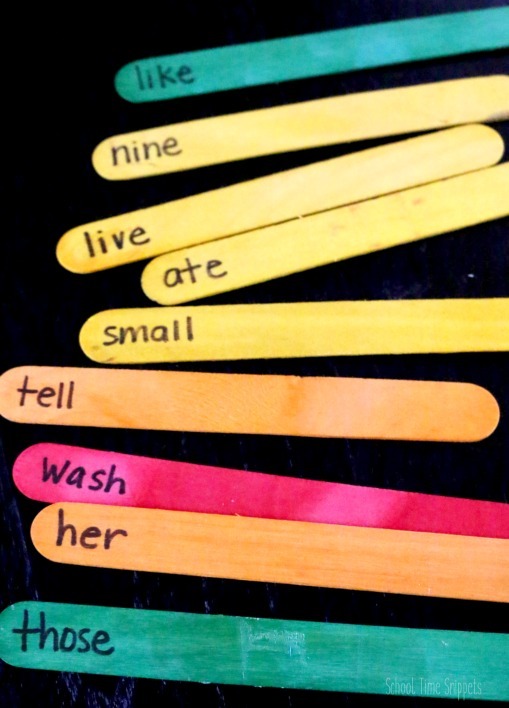 Place the popsicle sticks "word-down" into the small container. When Big Sis and I play, we set a timer for 10 minutes. However, you may choose to simply play "first to five popsicle sticks,wins" or whatever number you decide. The first player picks a popsicle stick and reads the word. If read correctly, the player gets to keep the popsicle stick. If incorrect, place the stick back into the container. Now because it was essentially a race between Big Sis and I, I would let her continue to try to read the word correctly. Then, the other player picks up a stick and reads the word. BUT WAIT! If a player picks up a "OH Snap!" 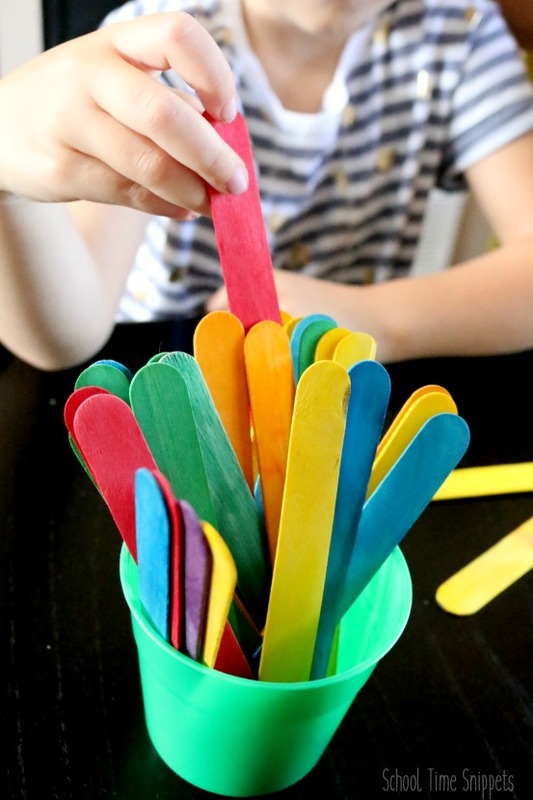 popsicle stick, the player must then put all the popsicle sticks back into the container!! Thus, continue playing until the timer runs out or you reach X number of sticks.... whatever you choose! The goal is to make this a fun way to practice reading words so that your beginning reader will know them automatically-- without thinking and sounding out the letters. Enjoy this fun game!! We aim to play it at least once a week!